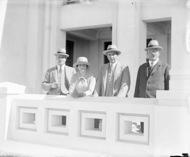 Rt Hon Stanley Melbourne Bruce and Mrs Bruce with Sir John Butters and Sir John Hanson at Parliament House construction. Prime Minister, Rt Hon. 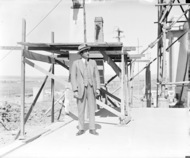 Stanley Melbourne Bruce, inspecting Parliament House. 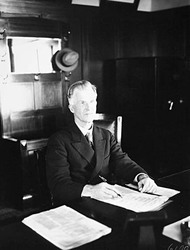 Prime Minister Rt Hon Stanley Melbourne Bruce in one of the Parliamentary chambers. 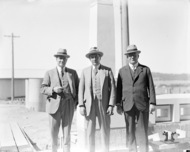 Prime Minister Rt Hon Stanley Melbourne Bruce at Parliament House. Visit of the English Cricket Test Team. Visit of team to Parliament House. Prime Minister Stanley Melbourne Bruce second from left.